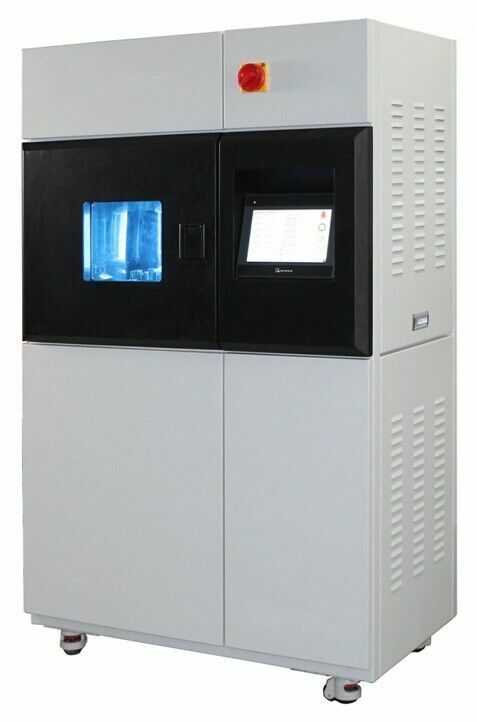 This machine designed to meet the requirements of ISO 105 B02 and AATCC Test Method 16 standards. It has a rotating specimen rack and provides precise control of critical test parameters including spectrum, irradiance, relative humidity, chamber temperature and black standard temperature. To determine the resistance of the color of textiles to fade when exposed to artificial light (xenon arc) which is representative of natural daylight. 2. Graphic display of the progression of all test parameters. 3. High performance, long lasting, air-cooled xenon lamp. 4. Solar-powered radiometer, incorporating a black standard thermometer. 5. Works in "controlled irradiance" or "blue wool" mode. 6. Eleven double-sided sample holders offer a massive exposure area of up to 1370cm². 7. Refined software which perfectly reflects the needs of the operator. 8. High efficiency power supply ensures running costs remain low. 9. Complies with international standards for textiles, leather and other materials. 10. Compact, stylish and ergonomic design. 3.Synthetic Rubber Diaphragms(Maufacturer James Heal) 05 Nos. 4.Diaphragm Unit Tightening wrench 01 No. 5.Air Pipe (To connect with compressor) 01 No. 9.This User's Manual 01 No. 10. Inspection & Conformance Certificate 01 No.